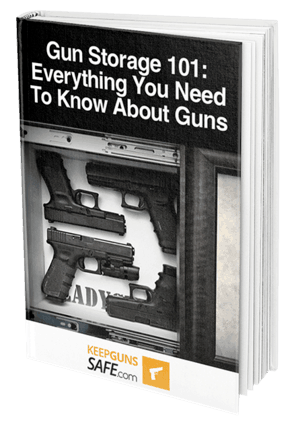 Proper gun storage is one of the easiest ways you can make your home a safer place, regardless of whether you live alone or if you live with family. Many gun owners make the mistake of thinking that a gun safe is only there to ensure that children will not get their hands on your gun. There are many other reasons why a gun safe is a good investment. Regardless of whether or not there are children in your home, your weapons should always be kept in the safest possible location. Guns are hot commodities, for criminals more so than anyone else. A stolen gun is the easiest way to circumvent background checks for convicted felons. So, it makes sense they would be ripe targets for burglars. As much as your guns may be worth to you regarding sentimental value and outright price, we can guarantee you they are worth a lot more to a felon who is planning some nefarious deeds. Beyond the monetary risk, do you want your stolen gun to play a part in the harming of an innocent person? There are a few complications when it comes to gun storage, however. For example, not everyone has enough room in their home to hide their gun safe properly. 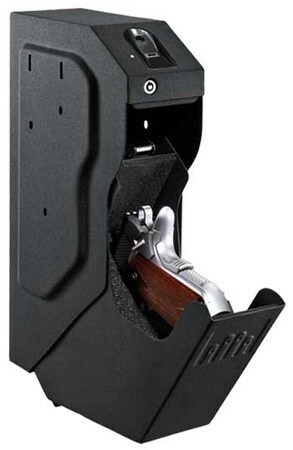 It is for this reason we will be looking at one of the smallest gun safes available for purchase in this review. Before we move onto our actual review of the GunVault SVB500, we will be going over some of the characteristics which are integral to search for in the ​best gun storage safe ever. Feel free to skip this section if you would like to get right down to the review as soon as possible. A feature which is becoming more and more common in gun safes is biometric scanning technology. This is just a fancy way of saying these safes use fingerprint scanners for their locks. There are many inherent advantages to safes which feature biometric locks. The main reason they are an excellent addition to gun safes is that biometric locks make it much easier to open the safe under duress. Using a small keypad with shaky fingers can be quite difficult. Being able to scan your fingerprint and have the safe pop open simply makes this design a much better choice in emergency situations. Another feature that is growing increasingly common in gun safes is a quick-opening door. These doors can either be spring loaded, gravity operated, or even powered on the most expensive models of gun safes. 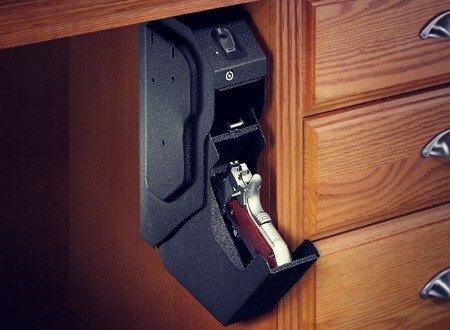 A quick opening door removes the need to manually open the door on your gun safe. This feature ensures that you will always have instant access to your gun from the moment you key in the code or insert the lock. Safes with quick opening doors are ideal for use in situations where there may be an intruder in the house and every second you spend is crucial. The SpeedVault SVB500 is a gun safe which is manufactured by GunVault. 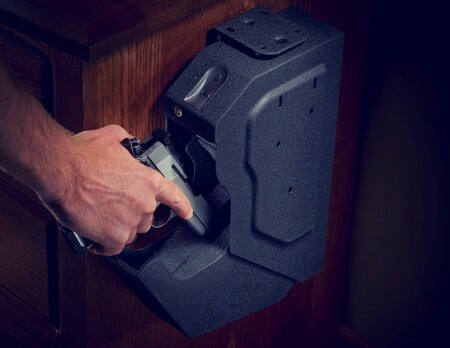 This gun safe is compact while remaining secure enough to deter any potential thieves. If you are looking for a gun safe that you can fit into a confined area, you will love this product. This product impressed us when we first installed it. We were not expecting such a high degree of durability out of a gun safe which is this small. This safe is sized to fit only one full sized handgun, so it essentially trades away all extra storage space for ease of installation due to its smaller size. The SpeedVault SVB500 is by far the best gun safe you will find for confined areas. It can fit in your drawer, or it can be installed on the underside of a desk. This gun safe can be mounted on either the left side, right side or on the back, so you have a wide variety of choices when it comes to the optimal way to position this safe. Another feature we appreciated was the inclusion of a quick-opening drop down door. This door design ensures that you will have access to your gun as soon as you slide your finger over the biometric scanner. 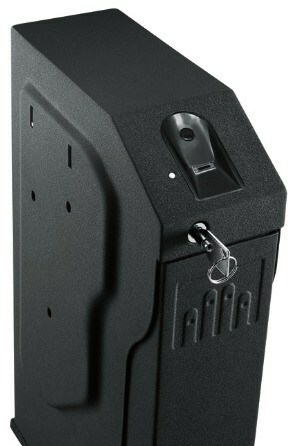 If you need a gun safe which is small, easily concealed, and quick to access, this is the best model for you. Customers were mostly impressed by just how small this model of safe is. Thanks to the design, it can fit in most places that would be too small for a traditional handgun safe. Many buyers were also happy with the fingerprint scanning system, remarking upon just how easy it is to open this safe in a hurry. Regarding negatives, some customers were disappointed by the lack of space for a magazine. Your gun must find storage with the magazine inserted, or you will have to find a separate location to store your ammo when you use this particular model of safe. This safe cost around 200 dollars, which is not as pricey as it may seem when you account for the biometric technology and many of the other features. This gun safe can be found at several online stores, including Amazon. If you are in the market for the smallest gun safe possible, then you will love the GunVault SVB500. We hope that our review has proved to be comprehensive and useful. If you have any further concerns, feel free to leave them down in the comments section.